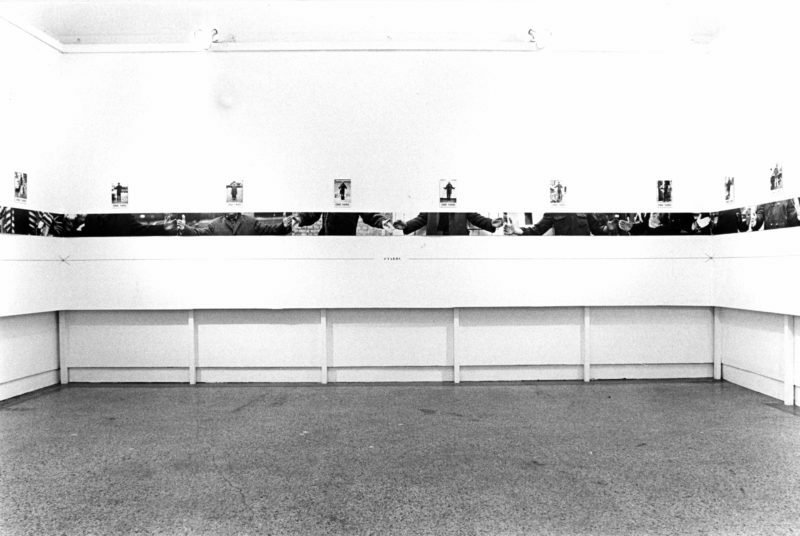 Staged and filmed as a video performance at the Neue Galerie – Sammlung Ludwig in Aachen on May 5, 1977, Territory – Living Space was intended by Michael Druks as an independent work of art, not merely documentation. A knife flies across a circle marked on a patch of sand. Two men (Druks himself with a volunteer, in this case Dieter Göllen) face up to one another. One of them marks his territory in the sand. We are witnessing a fight being played out, archaically in sand, or so it seems at first. The camera pans away somewhat, filming the sandy ground from a bird’s-eye perspective and the protagonists at the perimeter, who take turns throwing the pocketknife onto the ground. In black-and-white, the circle resembles a map or a world disc—a microcosm of the macrocosm. A metaphor, it would seem. Druks takes up a children’s game he was familiar with in Israel: “Territory.” A circle is drawn on a patch of sand; the circle is then divided, so that each half is the land belonging to one of the respective players. With the game set up, each player now throws a penknife onto the territory of the opponent. The expanse of this “territory” is continuously reduced until one player no longer has any space left to stand on. Here space is mapped and marked, one’s own and that of the opponent, or indeed that of an enemy. Throwing a penknife clearly touches on a political dimension. In reference to this, Michael Druks has said: “Don’t forget that I am an Israeli living in London and performing in Germany. […] I performed it in Aachen (1977) against a German volunteer. In 1998 I performed it in the Tel Aviv Museum (Perspective on Israeli Art in the Seventies), I performed against an Arab-Palestinian volunteer. As far as I remember, in all […] cases I let my opponent win.” The artistic gesture, expressed in the seeming simplicity of a children’s game, can thus also be interpreted as a genuine political gesture of peace.